HomeHey!- Who.. Umm … Is it you????? Hey!- Who.. Umm … Is it you????? 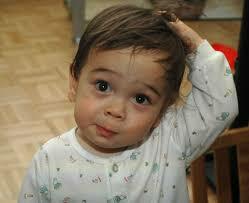 Image description … a baby, about 18 months old, in Pjs scratching its head in confusion. This will be a very short Rebuttal. Many of you will know that last year the Government kind of defunded Deaf Australia and Deafness Forum. Then they kind of refunded them in a roundabout way. Almost a year ago the Government announced that they had funded a consortium under People with Disabilities Australia (PWDA). PWDA were to represent a number of disability groups including deafness it seemed. Naturally Deaf Australia and Deafness Forum were up in arms at being defunded. They did not have a lot of faith that PWDA could meet the needs of the Deaf and hard of hearing populace. A little bit later, in its wisdom, the Government decided to provide the Australian Federation of Disability Organisations (AFDO) with 600 grand to represent a further 10 disability groups. Among them were Deaf Australia and Deafness Forum Australia. So one assumes that when this happened PWDA were no longer representing the Deaf and hard of hearing populace and this was now the responsibility of AFDO. One assumes that AFDO would now represent the people who are Deaf and hard of hearing through Deaf Australia and Deafness Forum. That’s my take on it any way. But you see I really would not know because there seems to be very little communication happening. I am just totally confused about who is representing who. Now last week we had the wonderful success of the Let’s Talk About It – Deaf People and Mental Health Conference. It is not well known, but this conference had its seeds in the passion of a few people who had an interest in and lived experience of mental health. As it so happened these people became aware of funds available for a conference. To make it happen they needed an incorporated organisation to lead it. Deaf Victoria came on board to be that organisation and then led the planning and nitty gritty of the conference admirably from there on. We needed them to take the issues raised at the conference to the very top. Since the conference Deaf Australia have taken a keen interest in the issue of mental health and are keen to work with Deaf Victoria to get a consistent national message out across Australia about the important issue of specialist mental health support for people who are Deaf or hard of hearing. This is great news. As is the push from Deafness Forum to establish deafness among the top ten health priorities in Australia. But where do PWDA and AFDO fit in? It’s these organisations that control the bulk of the funds, but we have not heard a peek from them on the issues of Deaf and hard of hearing. At the moment there are important Government policy changes happening. One is the Willing to Work consultation that is looking at the effectiveness of the Disability Employment Service. It is consulting widely with the disability sector. Feedback from this consultation will guide the Government of its strategy and policy in regard to disability employment.Who is representing us? Another important policy push is in mental health. Federal health Minister, Susan Ley, is currently doing the rounds explaining how the Government is keen to develop an individualised approach to mental health support. Part of this change is the development of a one number, digitalised, phone number that will connect people to the services that they need. I am really pleased that the Government is looking to improve mental health support. However, the individualised support and the digitialised phone number suggests to me that they are not really considering some of the specialist needs of the Deaf and hard of hearing sector or indeed the disability community. SO!!! – Who is representing us?? Is it AFDO who lead the consortium of ten that Deaf Australia and Deafness Forum are part of? Is it PWDA who are supposed to represent all disability groups? Is it Deaf Australia and Deafness Forum, with approval from the AFDO bosses? I have no idea. Do you? All of these organisations have clout. All of them have knowledge. All of them have fine advocates within their ranks – But WHO is representing us? Hopefully, soon, we can make sense of the maze that the Government has created because quite frankly, at this point in time, I have no idea whats going on. A year on since the Government announced the changes to funding disability advocacy groups you would think it would be a bit more clear. Can someone please let us know!!! As always Deaftastically honest, and transparent!! Thanks again For raising the obvious . It’s DEAFGUSTING to read here that Deaf Australia from each state were not registered at the “Lets talk about mental health ” conference. Talk about “Tall Poppy syndrome” all the best David Brady and Deafness Forum you have my vote!!! Thanks for representing ALL deaf !! I think your comment is quite unfair Lorraine. YOUR comment disgusts me. Where is your support for the community? Did you consider that there may be a reason for it? Anyway, it is my understanding that there were representatives from Deaf Australia (SA) and of course there was Deaf Victoria who led the conference so it was not completely unrepresented. I personally do not believe that Deafness Forum represents the best interest of the DEAF AUSLAN community, holding more of a medical/hearing health view. It just goes to prove that Deaf Australia needs our support NOW to ensure that they represent us appropriately- rather than being attacked. If you feel so strongly about it Lorraine, why don’t YOU join the Deaf Australia board and make a difference rather than being a keyboard warrior? Join Deaf Australia. Board are you joking . I have offered my work to Deaf Australia for years only to be told um sorry at this time we don’t have funded workers to follow up or to do that but keep up the good work LorrIne. Haaaaa as you have attacked me personally yet you have remained anonymous you have disgusted not only me but all readers here in Your weakness . Best wishes ANON that one day you can actually face me and say the above. I await your suggested meeting time and date !!! It isn’t singled out it is addressing the original statement and supporting it hence have another read adefinit2 who ever you are Your hiding as well god bless . Ps ANON keyboard warrior best that you google me and see my achievements when I was working voluntarily for the Deaf Community for years . My allocates are numerous for the Community what are yours?? come on out from the shadows key board warrior ANON I don’t see your allocates here it would expose you wouldn’t it? who are you and what why are you hiding god bless your strength in speaking up just do it openly or let’s meet I can tell you face to face of my work for and with MY community .